In this interesting article Markku Eskelinen argues that while the dominant user function in literature, theatre and film is interpretative, in games it is the configurative one. 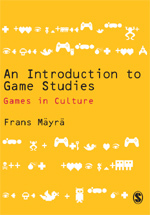 Many of the key analyses of contemporary games are based on cultural studies and media studies approaches; this book by Dovey and Kennedy is one of the more interesting ones. Dovey, Jon and Helen W. Kennedy (2006) Game Cultures: Computer Games as New Media. Maidenhead: Open University Press. Preview available from Amazon.co.uk.